Garam masala is a 'Spice Powder Mix' generally used in Indian Cuisine. It is generally used in most of the Indian Veg or Non-veg preparations such as Curries, Biryanis, etc., to give the strong Flavor and Aroma to the dish. 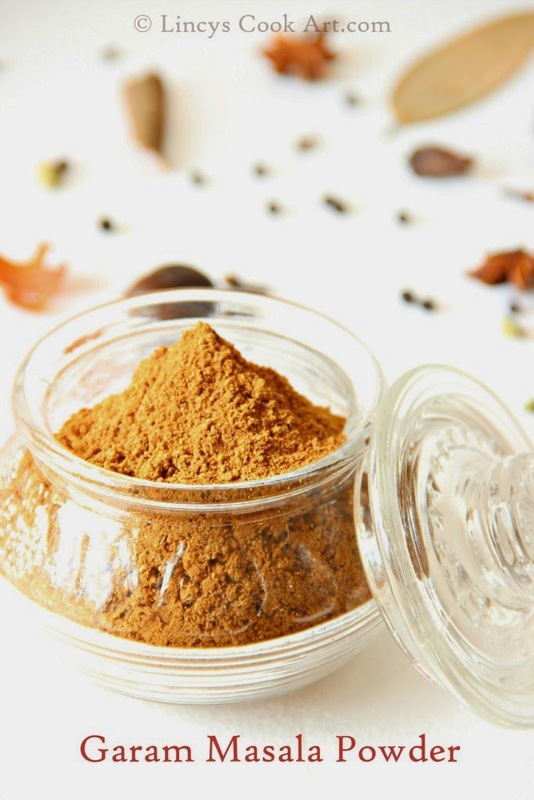 This Garam Masala makes the dishes prepared Delicious and more flavorful. Making this at home so that it could be prepared freshly depends on our taste and spice level. Easy to make in 15 minutes. Can last its flavor for months if stored in air tight container/jar. If you do not get some spices like Black cardamom, Mace, Nutmeg.,etc you can avoid those and prepare the powder. I once bought the store bought garam masala and i have not used it since and threw it out after keeping for a long period since i did not like the taste of it. Once i started making at home, i have never bought ready mix powder from shops. You can realize the aroma while grinding the masala itself. Lightly dry roast (heat) all the spices together in a pan till it get heated. You can check this by touching the spices. (To lift up the flavour and also to powder the spices easily) Cinnamon bark also will be easy to break after heating to accomodate in the blender. If you are planning to powder this in mill you can give it together. If you are planning to powder in home follow this procedure. Separate roughly the coarse textured spices in one lot and smaller spices in another lot. Cinnamon bark and Fennel seeds takes time to powder. Suppose your blender will not powder as fine powder sieve them and grind again the coarse pieces again. I have not done this. Tip in both the powder on a news paper and mix thoroughly with spoon and allow to cool to room temperature. Transfer this in a air tight jar and use the masala powder for your desired preparations. After powdering you will get around 1 1/2 cup of Garam masala power for the above said measurements. You can also include Marathi Moggu (Kapok/ Silk cotton Buds), Black stone flower, poppy seeds also in this garam masala powder. I do not use Dried Red Chillies or Coriander seeds in garam masala as we include separately both almost in all preparations. I usually buy but now; time to make my own version for the heavenly scent. Useful post....... Love the clicks!! Very useful post. Beautiful clicks too. I can survive with this spice powder, fantastic post with bright and neat pictures. home made is always the best. love the fresh grind masala fragrance. Love the garam masala with the mindblowing clicks . We bloggers like to make them fresh and we can use whichever we like in the proportion we want right ?